Where to Buy Maxforce FC Roach Bait Gel 60G, Maxforce FC Roach Bait Gel 60 Gram Tube - $12.95 for Sale with Fast Free Shipping! Maxforce FC Roach Bait Gel 60 Gram Tube comes in a sixty-gram tube and it is effective to all kinds of roaches. The Fipronil (0.01%) substance is able to slay roaches on contact. Use mostly on cracks and crevices. (60 grams (2.1oz) per reservoir) --Included plunger and tip. 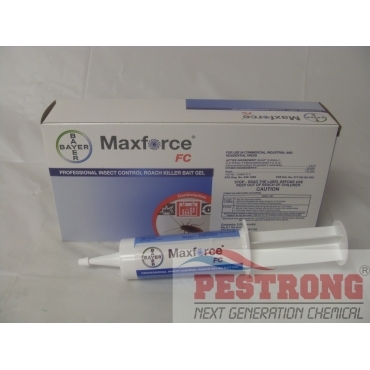 If you looking for more powerful, Use Maxforce Fc Magnum Gel Bait with fipronil 0.05%. Sold by each 60 gram tube. When I noticed dozens of little roaches all over my kitchen, I decided to give this product a try before investing in anything pricey. I applied this all over the edges and crevices. After a week I'm happy to say that I have not seen a live roach yet. Great product! Great roach control for my home with this jumbo size. I like it.